The Flaming Star Nebula (IC405) at upper right. The star AE Aurigae is the bright star in the right part of the nebula. Emission nebula IC410 is at lower left. Image credit: Terry Hancock. Stars in the Milky Way tend to revolve around the center of the galaxy, bobbing slightly above and below the galactic plane as if in a perpetual cosmic merry-go-round. But sometimes a star gets catapulted across the sky by a close gravitational interaction with another star. One of the best-known “runaway stars” lies in the constellation Auriga, the Charioteer. Known as AE Aurigae, this blazing star is passing by chance through a cold cloud of interstellar gas. The result is ‘accidental’ emission nebula cataloged as IC 405, but more commonly called the Flaming Star Nebula. The star AE Aurigae is a blazing-blue main sequence star about 17 times more massive than our Sun and 30,000 times as bright. But it was not formed in this part of the sky. Astronomers have traced its rapid motion back to a spot in the Orion Nebula. The star may have been ejected from the nebula about two million years ago, possibly by a close gravitational interaction of two multiple star systems in which some stars were flung away from Orion. Or it may have been were ejected by the gravitational effects of a supernova explosion of one of the massive blue stars that form in and around the constellation Orion. Whatever happened to AE Aur, it was not alone in its fate. Two other fast-moving stars also trace their origins back to the area of the Orion Nebula about 2 million years ago. One, mu Columbae, is located in constellation Columba, the Dove, well south of Orion. The other is the star 53 Arietis in the constellation Aries to the north and west of Orion. You can see AE Aurigae in the image at top in the extreme right of the nebula IC405, which itself is at upper right of the image. For such an intrinsically bright star, AE Aur doesn’t look like much. That’s partly because it’s quite far, about 1,500 light years, and also because it’s dimmed by interstellar dust which knocks down the star’s brightness by a factor of two. The star is easily visible in a small telescope and binoculars. The nebula itself is more challenging, though is can be glimpsed visually in a small scope. It looks like faint flames emanating from the star. Because its moving so quickly, AE Aurigae will pass through the cloud of gas in just 20,000 years and the nebula will fade away. The Flaming Star Nebula lies in an active and rich region of the sky. Just to the south lies the star-forming region marked by the emission nebula IC 410. Like the Orion Nebula, this is a star factory, and the gas is energized by its associated star cluster NGC 1893. In the foreground of the emission nebula are a patchwork of smaller dark nebulae sometimes called “The Tadpoles”. The entire complex lies about 12,000 light years away, about eight times as far as the Flaming Star. A wide-field panorama in the constellation Auriga. 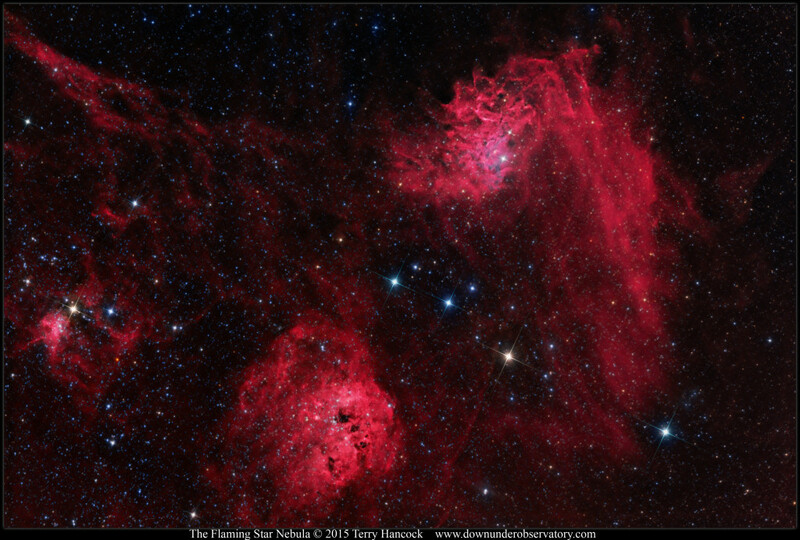 The ‘Flaming Star Nebula’, IC405, is at extreme upper right. IC410 is below and to the left of IC 405. The open stars clusters M38 (above middle) and M36 (below and near left) are also visible in this area. The image covers 8 degrees x 2.7 degrees. Credit: Terry Hancock. As shown in the wide-field image in this section there are fainter regions of nebulosity near the Flaming Star as well as two bright open star clusters Messier 36 and Messier 38. Both clusters, which are easily visible in binoculars, have shed the nebulosity of their birthplace millions of years ago. M36 and M38 are 25 million years old and about 4,000 light years away.